When you and your significant other want to get away for a one-night respite to relax, enjoy a wonderful meal and sleep in without an alarm clock waking you up, stay at the Four Seasons Westlake Village. It’s an ideal overnight or weekend holiday destination. The luxury hotel is formal, yet friendly and comfortable. There is a top-notch spa and one-of-a-kind wellness center. The pool is inviting for a swim or for lounging with a favorite book. Best of all the new Executive Chef Jesse Hansen is creating award-winning dishes and special Chef Table dinners for guests. 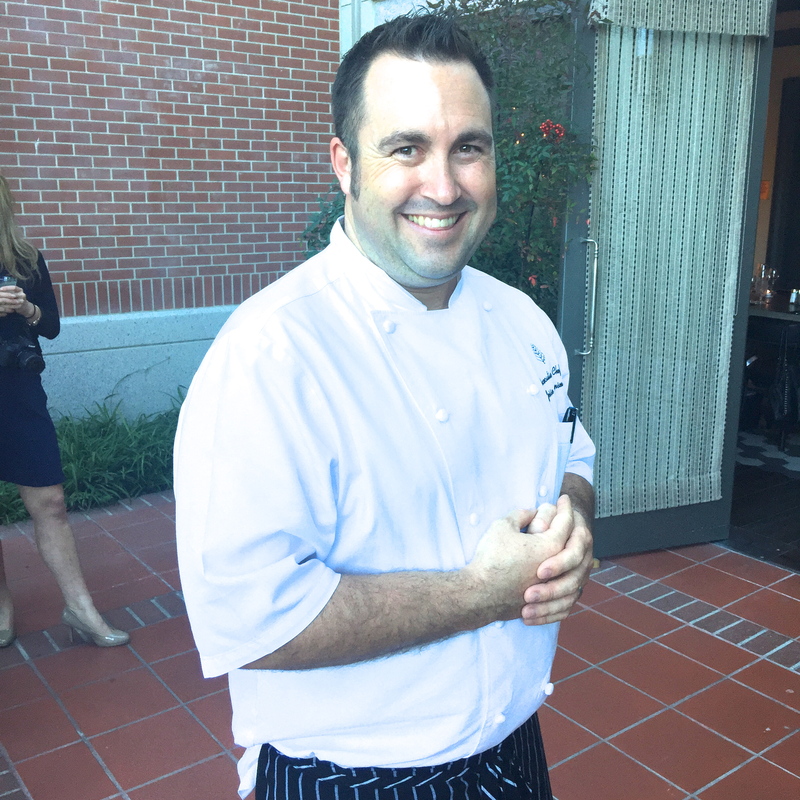 Chef Jesse started working for the Four Seasons in 1997 at The Biltmore Santa Barbara. He acquired a diverse culinary background cooking Tex-Mex for a corporate retreat one day and biryani for an Indian wedding the next day. After Santa Barbara he was promoted to other Four Seasons Hotels in Toronto, San Francisco and Scottsdale. After checking into our room overlooking the hotel’s waterfall, we enjoyed a 45-minute Swedish massage at the spa, before enjoying a special Chef’s five-course Tasting Menu dinner paired with California wines in the Tasting Room. The Four Seasons Hotel Westlake Village has partnered with Malibu Family Wines to provide a contemporary wine tasting space located within the hotel. The Tasting Room celebrates the recent Malibu Coast AVA designation with tastes from Semler and Malibu Family Wines, complemented by wineries from throughout the Malibu Coast and California. Our first dish was an Ahi Poke. Chef Jesse enjoys traveling to Hawaii and eating Poke. His poke plate had raw tuna with seaweed, chili oil, Easter Egg radish, avocado and toasted Macadamia nuts. Most Ahi tuna is sprinkled with sesame seeds; Chef Jesse offers a nuttier essence with Macadamias. Kristine Bocchino, the Tasting Room Supervisor paired this with a Semler Estate Rose from Malibu, owned by Ron and Lisa Semler. Their dry Rose is made from 50% Syrah and 50% Grenache blend; the skin of the grapes sits longer to give this Rose structure and more body with a darker color. With a nose of ripe strawberry and scents of fresh rhubarb, it balances well with the chili oil of Hansen’s dish. It’s an excellent wine with Japanese and Hawaiian cuisine. Hansen gathered asparagus from Rivermaid Farms in Lodi and cooked it perfectly. Next, he poached an egg to decorate the top. When pierced, the luscious yolk bathed the stalks bacon wafers and a dollop of lemon ricotta and micro lemon mint. There was a nice balance of earthiness from the asparagus with the acidity of the lemon. Bocchino paired this dish with a Laetitia Estate Chardonnay from Arroyo Grande that is aged in French Oak and offers a richer amount of acidity than other Chardonnays. It was rich and buttery with a nose of honeysuckle and green apple. This wine balanced the earthiness and lemon zing of Hansen’s dish. Our third course consisted of heavenly scallops resting on a bed of herbed toasted farro risotto with a tomato chutney. It was paired perfectly with a Pinot Noir from Bien Nacido Vineyards in the Santa Maria Valley. Red wine with scallops? You bet. The earthiness of the shellfish marries nicely with one of the lightest red wines, Pinot Noir. Scallops hold up well with the structure of a Pinot. This winery has been owned by the Miller family for over 100 years in Santa Maria. There are even the originally adobe buildings still standing from the Spanish Land Grant. These winemakers keep a small amount of their grapes, about 20%, and sell 80% of their fruit to other wineries. Since they only make 200 cases of each varietal, they don’t have a tasting room onsite. The Four Seasons Westlake Village is their tasting room and always hosts a launch party. To make this Pinot, they leave the skin on longer to create the light red color. Leaving it on for three to four days gives the wine structure, tannins and mouth feel. Our main entree was a Snake River Farms Strip Loin sliced and served with Okinawa purple potatoes, baby turnips and a lovely mushroom Marsala sauce. It was a pretty dish displayed on top of a kale puree. Bocchino paired this with a red Ridge Vineyards Alexander Valley Estate “Geyersville” field blend of Zinfandel Carignane, Petite Sirah, and Mataro. This blend offers notes of blackberry fruit, ripe plum, rich cherry and cedar. 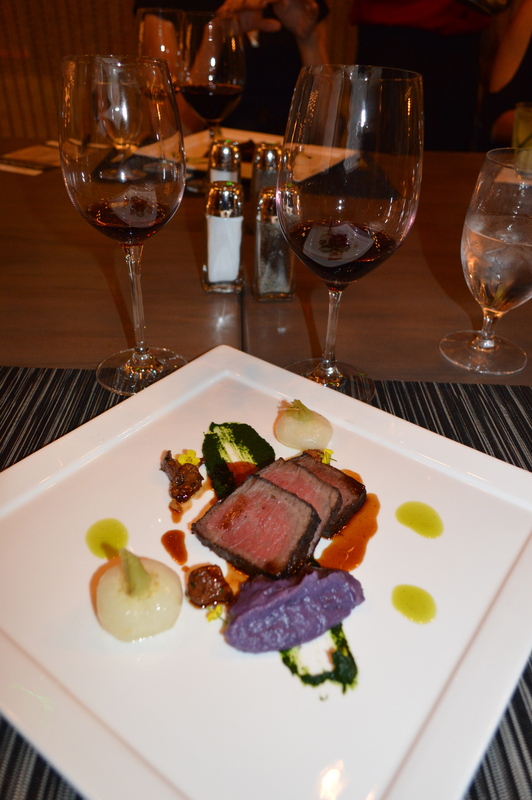 It’s an elegant wine paired with an exceptional dish. For dessert, pastry chef David Couch made a almond brown butter torte decorated with a strawberry rhubarb mousse and drizzled with a port wine caramel. It was served with a scoop of creme fraiche ice cream. It was visually beautiful and not too sweet. Bocchino paired this with a sweet late Viognier by Semler in Malibu. It sweetened the dish and was a perfect ending to a fabulous meal. We were pleased to walk back to our room for a good night’s sleep, rather than having to drive home. Sleeping well , we were rejuvenated and ready to go back to work with renewed energy and optimism.